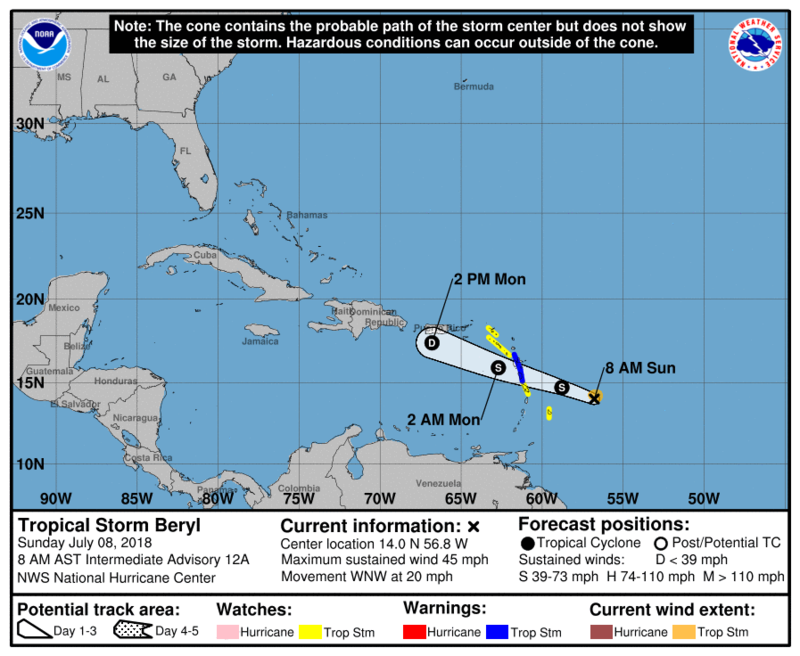 The 8AM report on Tropical Storm Beryl shows she is more disorganised but still heading in a West NorthWestward direction towards the Lesser Antilles according to the National Hurricane Center. A Tropical Storm Warning is in effect for Dominica and Guadeloupe. The islands of Barbados, Martinique, St. Martin, and St. Barthelemy, Saba and St. Eustatius and St. Maarten are under a Tropical Storm Watch. At 800 AM AST (1200 UTC), the poorly defined center of Tropical Storm Beryl was located near latitude 14.0 North, longitude 56.8 West. Beryl is moving toward the west-northwest near 20 mph (31km/h), and this motion with an increase in forward speed is expected during the next couple of days. On the forecast track, the center of Beryl or its remnants will approach the Lesser Antilles today, cross the island chain tonight, and move near or south of the Virgin Islands and Puerto Rico on Monday. Tropical storm conditions are expected in Dominica and Guadeloupe tonight. Tropical storm conditions are possible in the watch areas of the Lesser Antilles by later today or Monday. Strong gusty winds are also possible in the Virgin Islands and Puerto Rico on Monday. Beryl is expected to produce total rain accumulations of 1 to 3 inches through Monday across the southern Leeward and northern Windward Islands. Across Puerto Rico, rainfall amounts of 1 to 4 inches are expected. Across the remainder of the Leeward and Windward Islands and the Virgin Islands, rainfall amounts of 1 to 2 inches are expected, with locally higher amounts possible. Interests elsewhere in the Leeward Islands, the Virgin Islands, Puerto Rico, and the Dominican Republic should monitor the progress of Beryl.